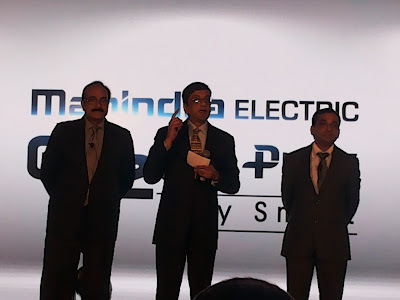 India’s pioneer in Electric Vehicles (EV), Mahindra & Mahindra is looking for a bigger play in this segment with the launch of the e2oPlus. The company have loaded e2oPlus with features like a modern-day smartphone that can be powered remotely. A smartphone app provides information of the car’s status on the battery charge, and even sends a reminder for its various functions. One can remotely lock and unlock the car, start and stop charging, turn the car on and off, switch the air conditioning on and off and even set a schedule using the smartphone app. Infact, to reduce noise and air pollution in major cities across India, the government is aggressively planning to roll out over 50 lakh electric and hybrid vehicles on Indian roads in the next three years. 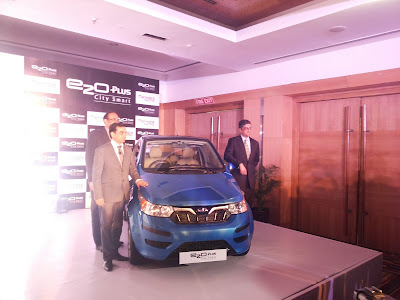 Mahindra Electric is the only company to roll out pure EV cars in India and has sold about 1.350 cars in Bengaluru, its major market in India. At the core of the e2oPlus is a collection of connected features that have been developed to make the car both easier and more enjoyable to drive and maintain. Whether it’s remote diagnostics through telematics monitors the e2o on a daily basis giving instant diagnosis of any existing or impending problems or even planning a route, checking the health of the car or remotely cooling the car, the e2oPlus seamlessly integrates technologies to offer functionality and is aptly designed for easy urban computing. The EV is certainly set to “Redefine the Future of Mobility” as Arvind Mathew, CEO of Mahindra Electric puts it. E2o, the 4-door variant is equipped with a GPS enabled navigation system and an on-board computer that warns you about the car's driving range. The touch-screen monitor is easy to use and very responsive. “The e2oPlus is one of the more advanced cars on Indian roads, with smartphone-controlled features, GPS navigation system and a dashboard-mounted touchscreen, keyless entry, start/stop button, and regenerative braking,” he adds. the e2oPlus app on your smart phone besides the mobile app also hosts other features like switching on/off the car's air conditioning, advance infotainment system and even locking/unlocking the car has also made the car smarter. There are other ingenious technologies that have been incorporated in the e2o such as Sun2Car, and regenerative braking system that further boost the car's range. The Sun2Car, for instance, allows people to charge the e2o using solar energy while it's parked. The regenerative braking technology puts energy back into the car’s batteries and charges them every time the brake is applied or the accelerator is not pressed. Mahindra e2o is manufactured through processes that do not pollute from the design stage in India's first Platinum certified automobile plant. The facility itself is naturally lit and ventilated, uses LED lights, recycles, gets 35 percent of its power from solar panels and is claimed to be 60-70 percent more efficient than a conventional facility. The car has a lithium-ion battery pack that takes five hours for a full charge and fast charging takes about 90 minutes. On a full charge, the car can travel for upto 140 km and can achieve a speed of 85 km/hr. Powered by the latest electric drive technology, the e2o can effortlessly cruise through the city traffic. The car is priced between Rs 6.73 lakh and Rs 9.51 lakh (ex-showroom Bengaluru). The e2oPlus has four variants - P2, P4, P6, and P8. The P4 is priced at Rs 6.73 lakh, P6 at Rs 7.31 lakh and P8 at Rs 9.51 lakh (ex-showroom Bengaluru). However, the company did not disclose the price of its P2 variant, which it said is for fleet owners.